The film includes original interviews with music icons including Willie Nelson, Dolly Parton, Marty Stuart, Garth Brooks, Brad Paisley, Darius Rucker and Charlie Worsham. It also includes several on-camera conversations between Pride and special guests, including Rozene Pride (his wife of 61 years), Nelson, and other fellow musicians. The piece also features recordings from Charley's repertoire of hits, along with modern cuts like "Standing In My Way" from his latest album, Music In My Heart, recently serviced to Americana radio. The inspiring and largely untold story of Pride's barrier-breaking life is shared in this special television event. Michael Kantor, executive producer of the American Masters series notes, "At a time when African-American singers were more notable for R&B hits, Charley Pride followed his passion for Country music, overcoming obstacles through determination and raw talent to make a lasting impact on the genre and create a legacy that continues today. We are honored to share his story with viewers nationwide." Intimate moments include Charley and Rozene speaking about the singer's struggles with bipolar disorder, how he maneuvered his way through the white ranks of Country music in order to gain acceptance in the industry, and recollections about the early days of his career with Willie. Radio transcended racial barriers in the 1940s, making it possible for Pride to listen to Grand Ole Opry stars like Ernest Tubb and Roy Acuff. He arrived in Nashville in 1963 as the city roiled with sit-ins and racial violence, but with boldness, perseverance and undeniable musical talent, he managed to parlay a series of fortuitous encounters with music industry insiders into a legacy of hit singles, a Recording Academy "Lifetime Achievement Award," and a place in the Country Music Hall of Fame. Pride is a natural addition to the American Masters series, which explores the lives of masters past and present. The program has earned 28 Emmy Awards, including 10 for Outstanding Non-Fiction Series and five for Outstanding Non-Fiction Special; 13 Peabody Awards, an Oscar, three Grammys, two Producers Guild Awards, and many other honors. 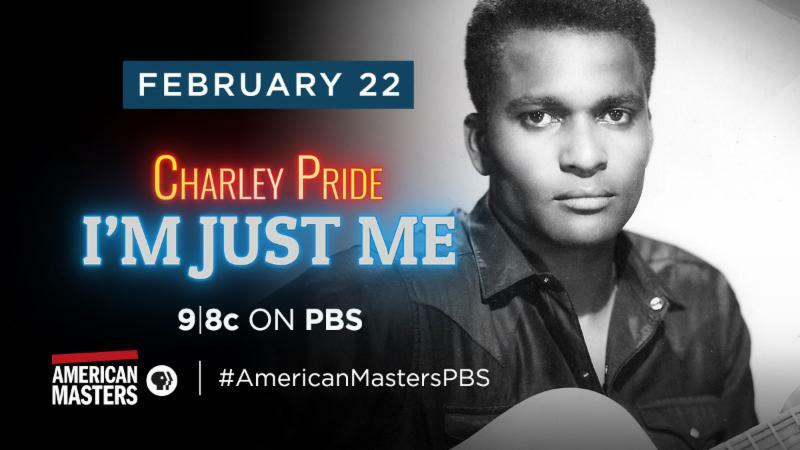 American Masters -Charley Pride: I'm Just Me is a production of Corridor Group Productions Inc. in association with THIRTEEN's American Masters and ITVS. The film is directed by Barbara Hall (American Masters Patsy Cline, 2017), who is also executive producer. Co-executive producers are Greg Hall, Suzanne Kessler and Ed Lanquist. Jon Schouten is producer. The episode was written by Jon Schouten. Charley Pride has enjoyed one of the most successful careers in the history of Country music and is credited with helping to break color barriers by becoming the first black superstar within the genre. A true living legend, he has sold tens of millions of records worldwide with his large repertoire of hits over a five-decade career. A three-time GRAMMY® award-winner and Recording Academy "Lifetime Achievement Award" recipient, Pride has garnered no less than 36 chart-topping hits, including "Kiss An Angel Good Morning," a massive #1 crossover hit that sold over a million singles and helped Pride land the Country Music Association's "Entertainer of the Year" award in 1971 and the "Top Male Vocalist" awards of 1971 and 1972. A proud member of the Grand Ole Opry since 1993, Pride continues to perform concerts worldwide and has toured the United States, Canada, Ireland, The United Kingdom, Australia and New Zealand over the last several years. His latest album, Music In My Heart, was recently serviced to Americana radio stations by Music City Records. Learn more about American Masters HERE.